Chocolate Spartak Cake: chocolate-y, 9-layer cake, filled with sour cream frosting, topped with chocolate ganache and decorated with buttercream flowers! 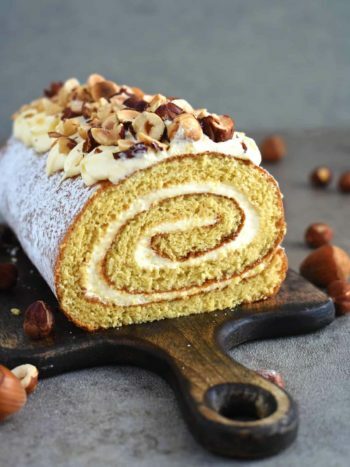 Want more Ukrainian cake recipes? Check them here: Chocolate Cherry Bundt Cake, Honey Cake, Strawberry Kiwi Cake. This cake is the favorite in my family nowadays! Everyone loves it…kids, adults, me, myself and I! 😀 When you start at a slice, you won’t notice when you’ve eaten the whole cake – you just keep eating it, and it gets better and better with every slice! (no kidding). This cake takes some effort, but then what cake doesn’t? You have to put effort into anything to make it look beautiful and delicious! But it’s not complicated at all, just takes a bit of time. It’s really easy to work with, just need your muscles to roll out each layer, but you cannot go wrong here. 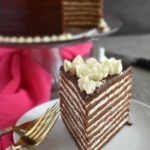 If you end up with a different brand of flour and add slightly more flour while rolling the cake layers than the recipe calls for, don’t worry about it. 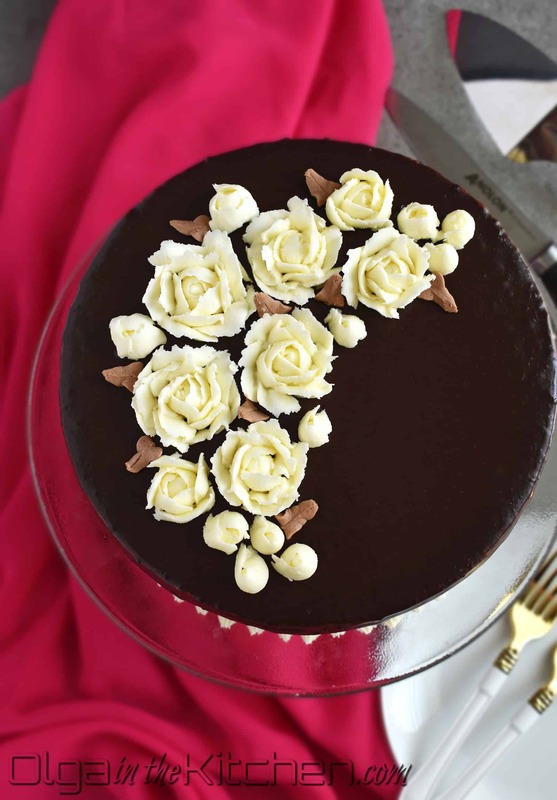 Once the cake is frosted, leave it at room temperature for few hours before refrigerating and it will do the trick. The cake will fall-apart in your mouth when served. 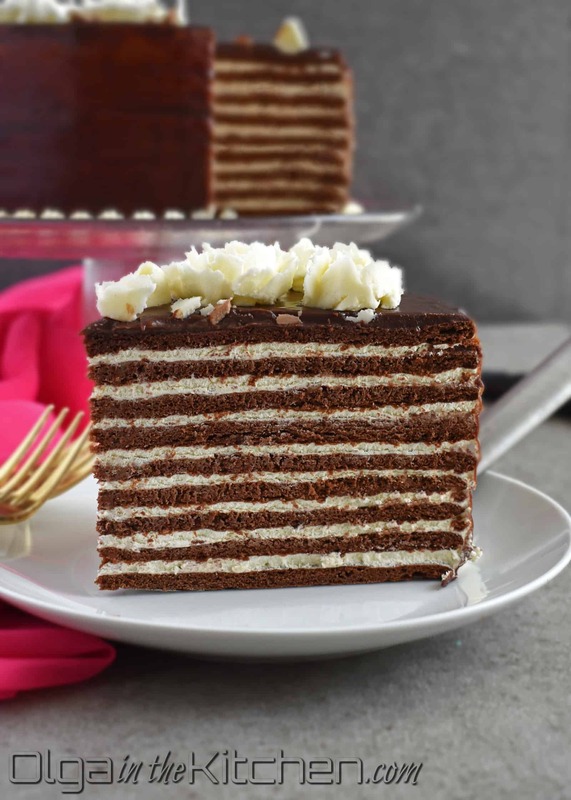 You can frost less layers of this cake, and use remaining to make the crumbs for the decoration, but there is something about chocolate ganache and chocolate layers, blending in nicely! Therefore, I always do chocolate ganache for this Spartak cake. I’m using a 36% heavy cream for the ganache in this post since I ran out of the usual 40% Darigold, so the ganache looks slightly on the thinner side, but the taste is still the same. 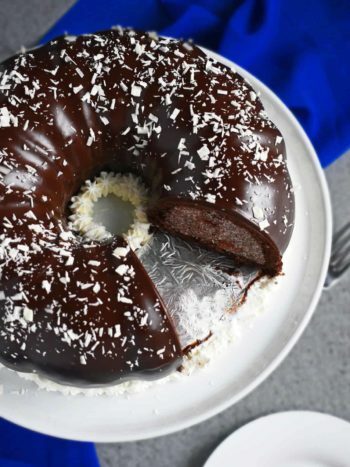 I use the remaining ganache to drizzle other baked goods that same day or next day. Refrigerate and reheat over water bath, but never dispose chocolate! 😀 It’s chocolate!! The cake must set before being covered in chocolate, otherwise chocolate will crack once the cake layers set. During the process of setting, the cake slightly shrinks down as the cake layers get moist and sit down closer to other layers. For best results, I frost the cake one day, and finish with ganache and buttercream next day. 1. 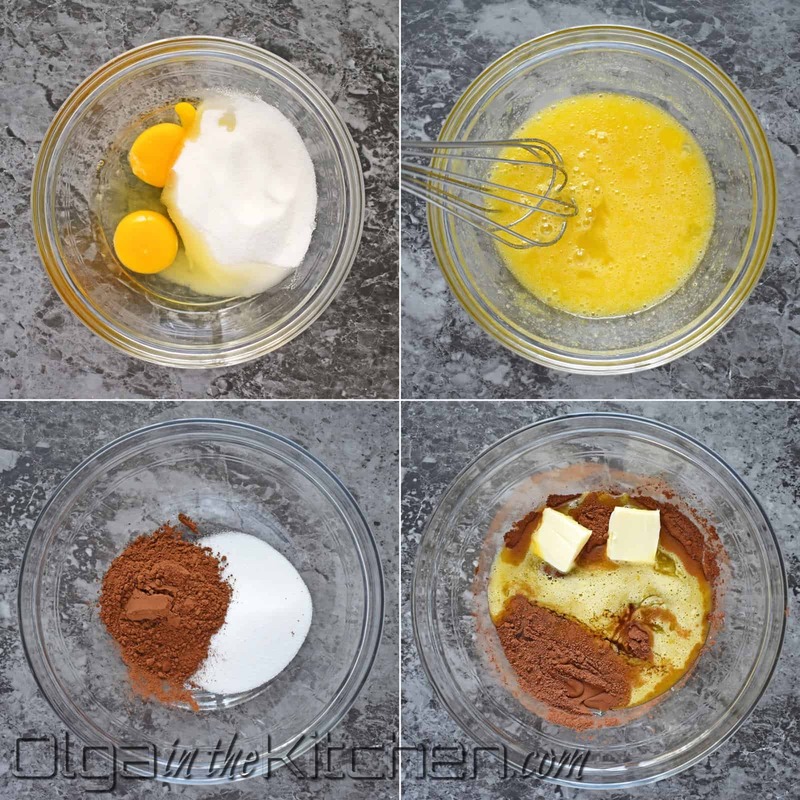 In a small bowl, combine and whisk 2 eggs and 1/2 cup sugar to break the eggs a bit. 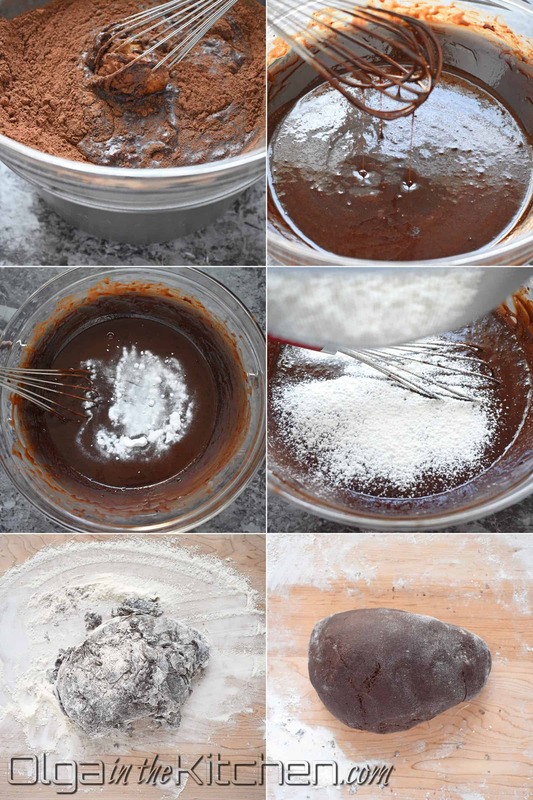 In a large bowl, combine and whisk 1/2 cup cocoa powder and remaining 1/2 cup sugar. To the bowl with cocoa, add the egg mixture, 4 tbsps unsalted butter, 2 tbsps honey and 1/3 cup milk. 2. Make a water bath, by bringing a large pot with water to a boil and reduce heat to medium. 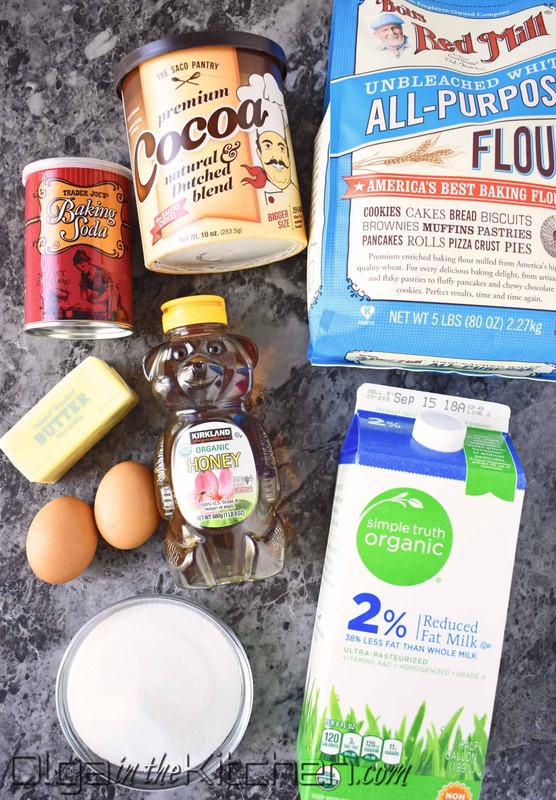 Place a bowl with mixture over the steam (make sure the bowl doesn’t touch the water) and keep stirring for about 10-15 minutes until the butter and the sugar are melted, all ingredients are incorporated and the mixture becomes hot. (I put a tip of my index finger into the mixture to test). Add 1 tsp baking soda and keep stirring for about 2 minutes until the batter turns foamy and slightly rises. Remove from heat, and immediately sift the flour, or add cup at a time if sifted ahead of time. (Do not let the dough cool or you will ruin the dough; use spatula to fold in flour into hot batter, then transfer the dough to a floured surface to finish incorporating the flour into dough). I do about 2 3/4 cups flour, by adding cup a time and use remaining when rolling out the layers. Preheat the oven to a 360°F. 3. Divide the dough into 8 similar to equal pieces. Sprinkle some flour when needed and roll out first dough piece to a very thin layer (about 2-3 mm thick) to cover a 9” form. Place the base of the springform pan over the rolled piece and cut out a circle, going around the form with a sharp knife. Transfer the cut out circle to a lightly oiled springform base, and bake for 8 minutes. (Meanwhile, roll out second piece and place onto same sized form, or wait until the hot form slightly cools off before placing next piece). As soon as the layer is finished baking, turn it upside down onto a tray. Remove the form with help of oven mitts and leave the layer upside down for 4-5 minutes (this will keep the layer bump-free and keep it flat). Turn it back to correct side, and stack cooled layers with parchment paper in between until ready to frost. Repeat this process until you’ve baked all layers. NOTE: do NOT throw away those edges! 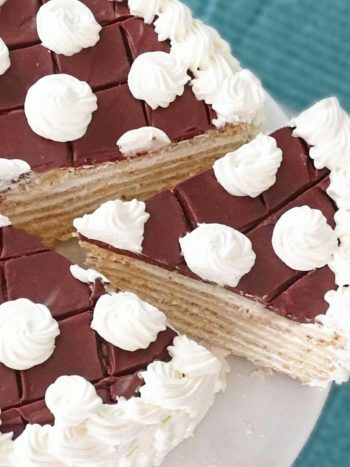 Form a ball from them, roll out and you will end up with 9th or even 10th layer, that could make your cake higher or use the extra layers to crumble and decorate the cake if you don’t want to cover in chocolate ganache. Cake layers will harden once cooled, but will be moist once frosted. 4. Using an electric mixer, beat 16 oz sour cream, 8 oz cool whip, 1/2 cup sugar and 1/2 tsp vanilla extract for 10 mins on high until frosting is thick and firm. Refrigerate until ready to use, but not for prolonged time or the cream might become slightly runny. Cut out a cake diameter carton circle. Wrap foil around carton. Spread a teaspoon of frosting onto foil before you place a first cake layer – this will keep the cake from sliding off the carton. Place about 3-4 tbsps frosting between each cake layer and spread evenly (make sure to get edges). 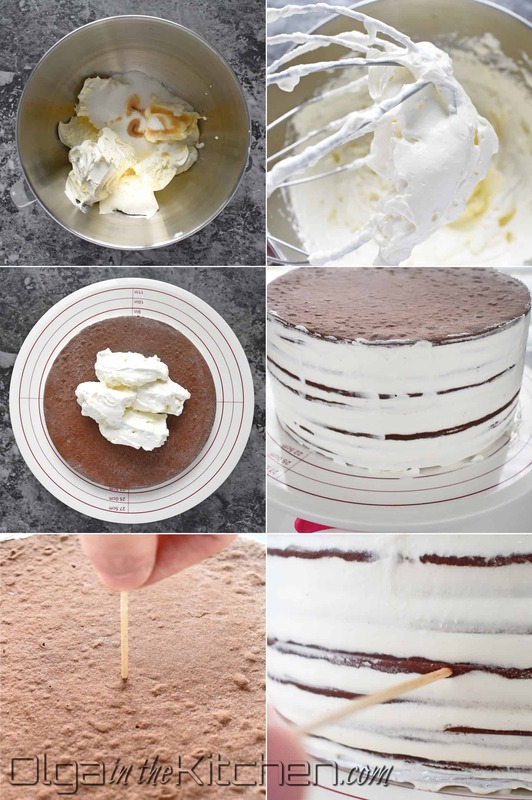 (**If you’re going to cover the cake in chocolate, do not frost the last layer – chocolate will be on top). Frost sides as well with any remaining sour cream frosting. 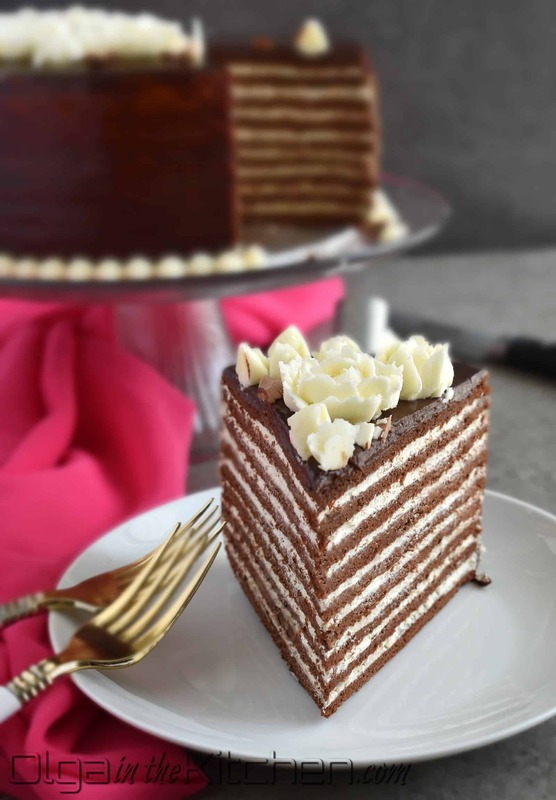 Leave the cake at room temperature for 2 hours so that the cake layers become moist. After 2 hours, insert a toothpick in the middle of the cake and then into a layer from a side. If the toothpick goes in easily, refrigerate the cake until ready to decorate. Do not keep the cake more than 4 hours at room temperature. 5. Place 2 cups mini chocolate chips into a medium bowl. Microwave 1 1/2 cups heavy cream for about 2 minutes until it’s hot and steamy, but not boiling. Meanwhile transfer the cake to a cooling rack from turning table with help of 2 large knives (make sure the knives hold the cake before you completely lift it up). Pour the heavy cream over the chocolate chips and keep whisking until all chocolate chips had melted. 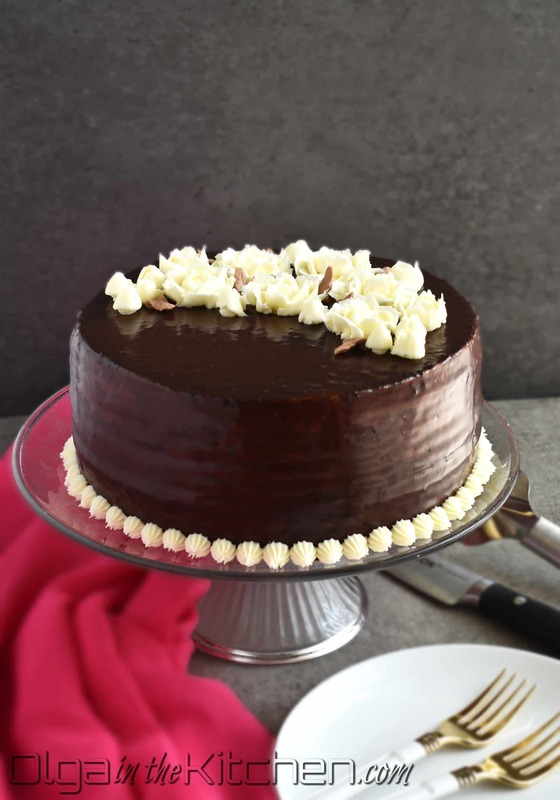 As soon as ganache slightly cools, start pouring over the cake – GO SLOW, starting from the top – pour, spread with a knife and slowly keep pouring on the edges going right and left to cover all the area. Don’t pour too much and don’t go fast or you’ll run out of ganache. **making more ganache to finish the sides will make overlaps on the cake sides and the cake won’t look nice. Let the cake stand for 5 minutes on cooling rack and then gently, using large knives, transfer to a cake stand. 6. In a medium bowl, beat 2 sticks unsalted softened butter for about 1 minute. Add 4 cups sifted powdered sugar (1 cup at a time), until all mixed in. 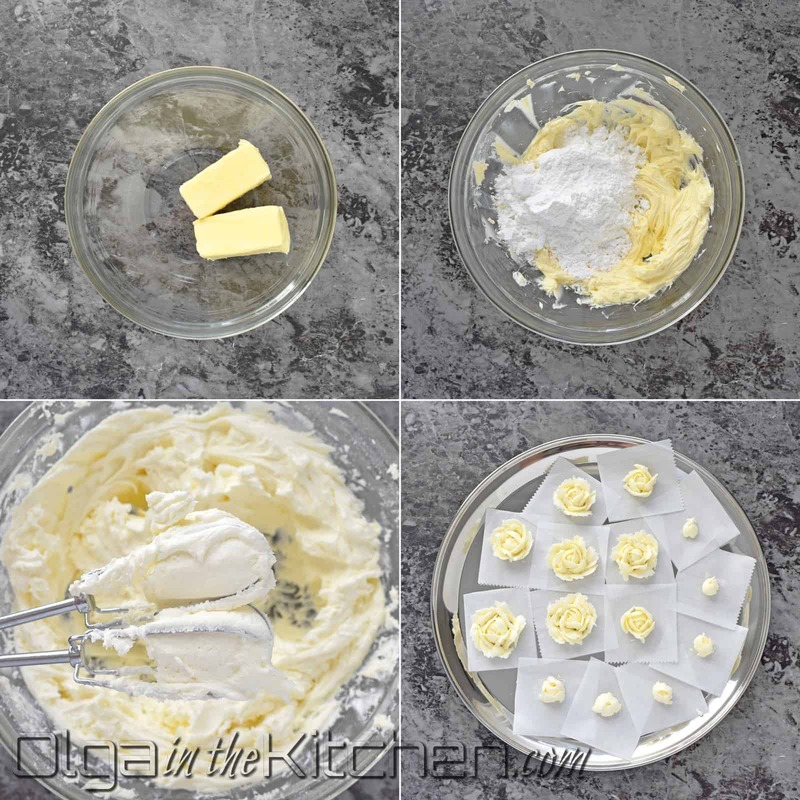 Use this buttercream to make roses or any flower or design you like. Pipe onto little parchment paper squares, place onto stainless steel tray and freeze for 5-10 minutes. (The stainless steel tray makes it freeze a lot faster). Transfer flowers to a cake and decorate to your liking. I added a bit of cocoa powder for the brown leaves. Refrigerate cake until ready to serve. Chocolate Spartak Cake: chocolate-y, 9-layer cake, filled with sour cream frosting, topped with chocolate ganache and decorated with buttercream flowers! 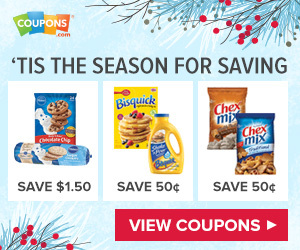 A family chocolate favorite! In a small bowl, combine and whisk 2 eggs and 1/2 cup sugar to break the eggs a bit. In a large bowl, combine and whisk 1/2 cup cocoa powder and remaining 1/2 cup sugar. To the bowl with cocoa, add the egg mixture, 4 tbsps unsalted butter, 2 tbsps honey and 1/3 cup milk. Make a water bath, by bringing a large pot with water to a boil and reduce heat to medium. 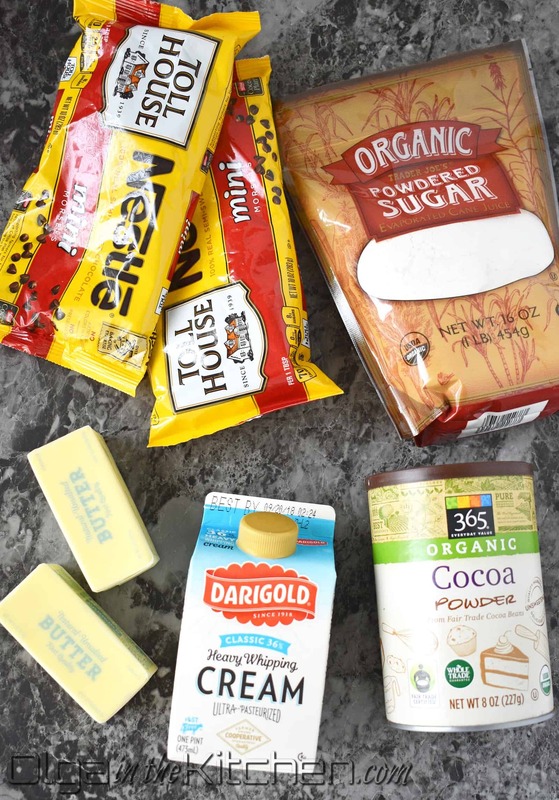 Place a bowl with mixture over the steam (make sure the bowl doesn’t touch the water) and keep stirring for about 10-15 minutes until the butter and the sugar are melted, all ingredients are incorporated and the mixture becomes hot. (I put a tip of my index finger into the mixture to test). Add 1 tsp baking soda and keep stirring for about 2 minutes until the batter turns foamy and slightly rises. Remove from heat, and immediately sift the flour, or add cup at a time if sifted ahead of time. 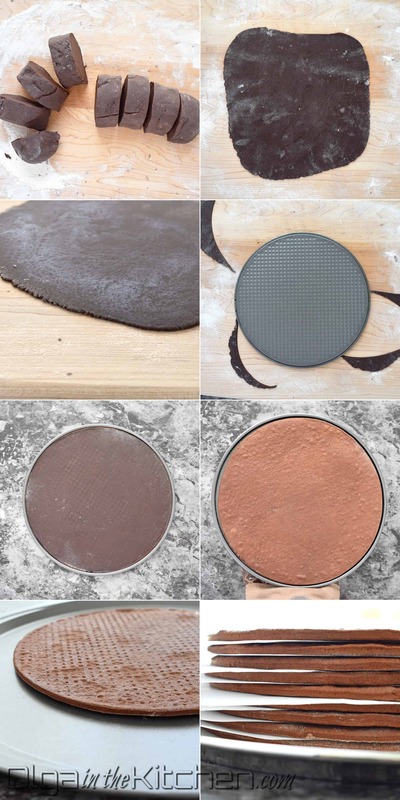 (Do not let the dough cool or you will ruin the dough; use spatula to fold in flour into hot batter, then transfer the dough to a floured surface to finish incorporating the flour into dough). I do about 2 3/4 cups flour, by adding cup a time and use remaining when rolling out the layers. Preheat the oven to a 360°F. Divide the dough into 8 similar to equal pieces. Sprinkle some flour when needed and roll out first dough piece to a very thin layer (about 2-3 mm thick) to cover a 9” form. Place the base of the springform pan over the rolled piece and cut out a circle, going around the form with a sharp knife. Transfer the cut out circle to a lightly oiled springform base, and bake for 8 minutes. (Meanwhile, roll out second piece and place onto same sized form, or wait until the hot form slightly cools off before placing next piece). As soon as the layer is finished baking, turn it upside down onto a tray. Remove the form with help of oven mitts and leave the layer upside down for 4-5 minutes (this will keep the layer bump-free and keep it flat). Turn it back to correct side, and stack cooled layers with parchment paper in between until ready to frost. Repeat this process until you’ve baked all layers. NOTE: do NOT throw away those edges! Form a ball from them, roll out and you will end up with 9th or even 10th layer, that could make your cake higher or use the extra layers to crumble and decorate the cake if you don't want to cover in chocolate ganache. Cake layers will harden once cooled, but will be moist once frosted. 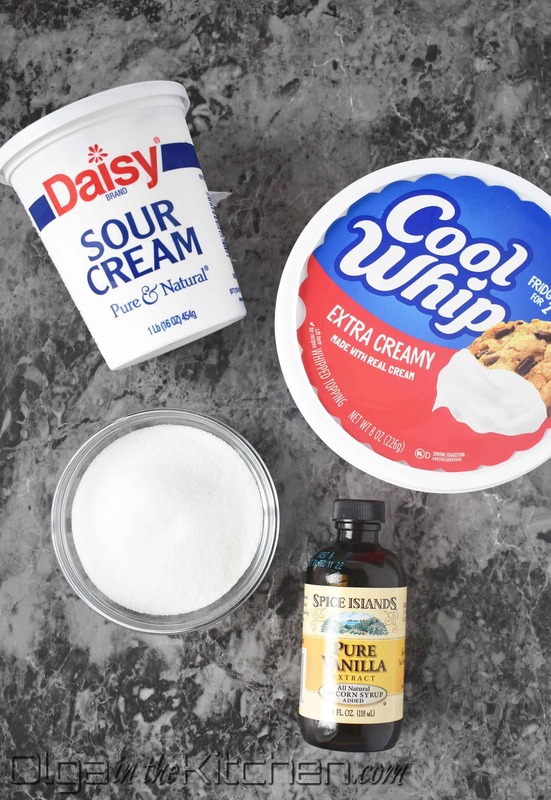 MAKE THE FROSTING: Using an electric mixer, beat 16 oz sour cream, 8 oz cool whip, 1/2 cup sugar and 1/2 tsp vanilla extract for 10 mins on high until frosting is thick and firm. Refrigerate until ready to use, but not for prolonged time or the cream might become slightly runny. Cut out a cake diameter carton circle. Wrap foil around carton. Spread a teaspoon of frosting onto foil before you place a first cake layer – this will keep the cake from sliding off the carton. Place about 3-4 tbsps frosting between each cake layer and spread evenly (make sure to get edges). (**If you're going to cover the cake in chocolate, do not frost the last layer - chocolate will be on top). Frost sides as well with any remaining sour cream frosting. 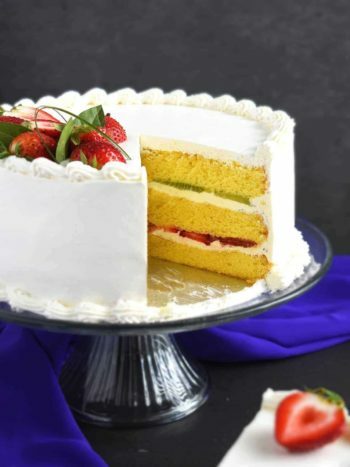 Leave the cake at room temperature for 2 hours so that the cake layers become moist. After 2 hours, insert a toothpick in the middle of the cake and then into a layer from a side. If the toothpick goes in easily, refrigerate the cake until ready to decorate. Do not keep the cake more than 4 hours at room temperature. MAKE THE GANACHE: Place 2 cups mini chocolate chips into a medium bowl. Microwave 1 1/2 cups heavy cream for about 2 minutes until it’s hot and steamy, but not boiling. Meanwhile transfer the cake to a cooling rack from turning table with help of 2 large knives (make sure the knives hold the cake before you completely lift it up). Pour the heavy cream over the chocolate chips and keep whisking until all chocolate chips had melted. 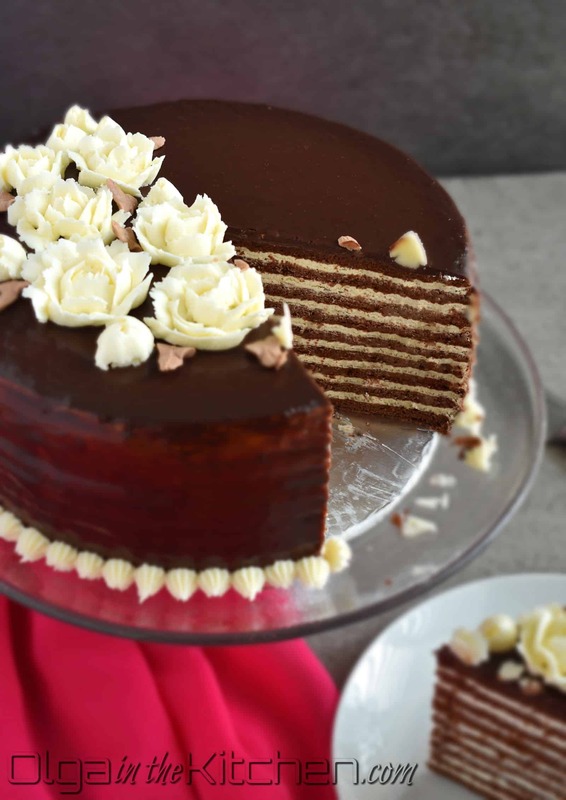 As soon as ganache slightly cools, start pouring over the cake – GO SLOW, starting from the top – pour, spread with a knife and slowly keep pouring on the edges going right and left to cover all the area. Don’t pour too much and don't go fast or you’ll run out of ganache. 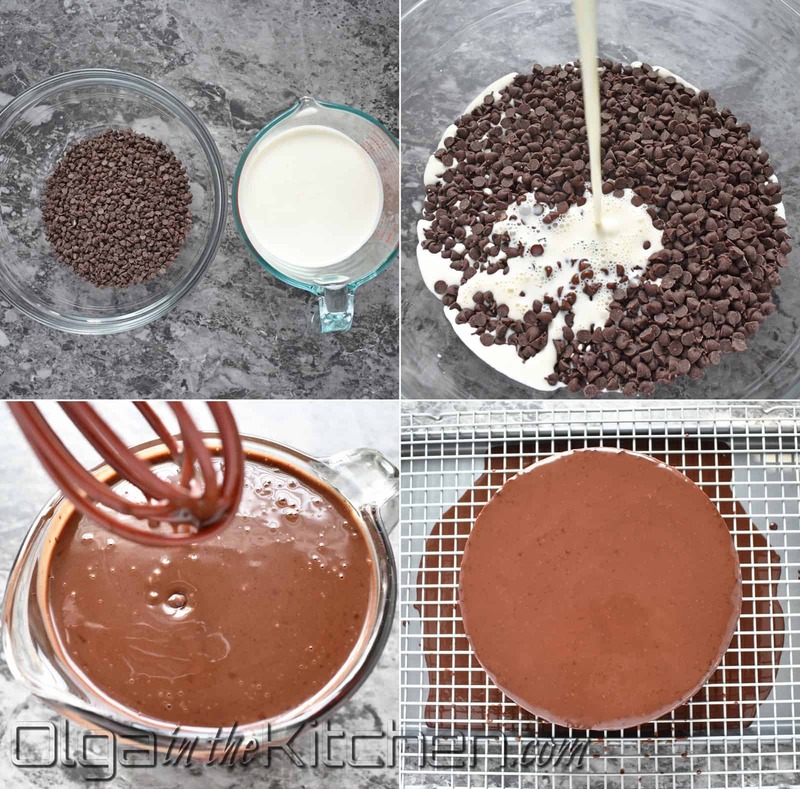 **making more ganache to finish the sides will make overlaps on the cake sides and the cake won’t look nice. Let the cake stand for 5 minutes on cooling rack and then gently, using large knives, transfer to a cake stand. © Olga in the Kitchen. All images & content are copyright protected. Please do not use my images without permission. If you want to republish this recipe, please re-write the recipe in your own words, or link back to this post for the recipe! Thank you for visiting Olga in the Kitchen! So we frosted the cake, and probably ate half of it already 😀 This is like literally the best chocolate cake we had ever eaten. It got moist so nice, and the sour frosting blends in so nicely into these layers. Thank you, looking forward to more of your recipes. I’m so excited for finding your blog!!! Thanks Abby for coming back and letting me know about the final results 🙂 I’m so happy to hear you guys loved it so much! Hi Olga – thanks so much for sharing this recipe. I’m looking forward to trying it very soon. Quick question – when keeping in the fridge after it’s all assembled and frosted, does it need to be covered or left uncovered? Thank you! Hi Olga, will it make a difference if I use whole milk as a cake ingredient instead of a 2 % milk? I baked this cake for Christmas and it was gone during first round! A little time consuming cake. but worth it after all. Thank you!